View examples of our creative custom work below. Click on images to take a closer look! Swinging saloon-style doors provide ease of passage through each room while blocking them off in an aesthetically pleasing manner. 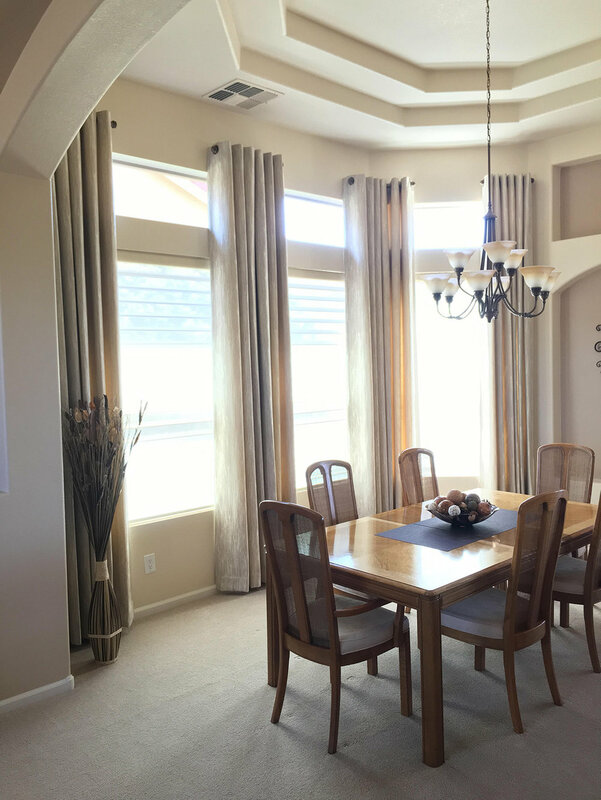 We custom fit louvered rectangular window coverings to wrap around this half-circle dining area. Cafe-style shutters provide privacy in areas where there is no light control issue. These arched window coverings are fully louvered for fine-tuned light control. These louvered shutter panels are enhanced with movable sunburst tops. Blinds and a top treatment provide filtered light for this workstation. Shutters and two-tone draperies frame this dining room well. Handle cut-outs for lever-style door handles make opening and closing doors with plantation shutters easier. These bi-fold plantation shutter panels were designed to match home aesthetics while covering french doors. Here, we created a custom frame for a piece of stained glass. We created fully louvered window coverings that followed the unique shape of the windows in this house. We designed a large movable sunburst arch alongside these rectangle window coverings, and stained them to match interior decor of home. Here, we paired draperies with shades to match the color palette of this room. These patterned draperies enhance the look of the plain shades and add a little bit of style to the room. Bypass sliding panels make seeing out of windows easier in comparison to swinging shutter doors. In designing these plantation shutters, we coordinated the existing drapery colors to the new louvered rectangular window coverings, matching the aesthetics of this home. 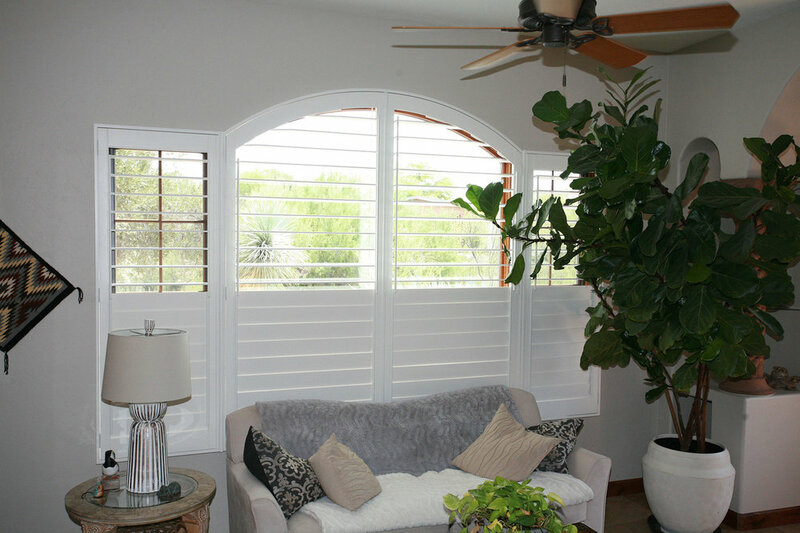 Double-hung shutters provide the option of opening the top or bottom for more light as needed. Louvered plantation shutters are mounted on sliding bypass panels for patio doors to make outside access easier, as well as provide light control and privacy. An example of blinds and draperies in a curved room. An example of shades with top treatments. We’ve helped a number of local Tucson businesses create solutions for unique challenges. Need help? Contact us today. This resort had a unique challenge in light control and insulation. We outfitted all South-facing second story loft rooms with custom 12 foot wide shutter panels to fit their pony windows. Some challenges this inn encountered is that corner windows are very difficult to cover. Being an inn, they particularly needed window coverings that would provide room darkening, and durability, as well as aesthetics that make the rooms cozy and match the rest of their decor. Prime goal was to maintain a rich look of wood throughout the restaurant while gaining light control and privacy throughout the entire building, including the windows and doors. It’s crucial that meeting rooms offer light control and privacy. We enhanced the aesthetics of the room with color matching to the ceiling, doors and trim, while creating a solution for covering the windows on their doors that don’t swing or need to be clipped when opened or closed. We worked around an aesthetics issue with a very tall opening and window above it, also used as an emergency exit. We built the emergency release function of the door into the design so it maintained function & looked appealing.